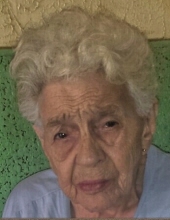 Linda Mae Anderson, age 86, formerly of Williamsburg departed this life on Wednesday, November 21, 2018 at her home in Toledo, Ohio. She was born on July 5, 1932 in Williamsburg, Kentucky to the late Ewell Lawson and Anna (Roller) Lawson. She was also preceded in death by her husband, Clayton Anderson; daughter, Doris Ann Scott; and brothers, Jessie Lee Lawson, Woodrow Lawson, Phillip David Lawson and Henry James “Pete” Lawson. She is survived by her children, Brenda Lee Stevenson of Toledo, Ohio and Vernon Kelly Anderson (Selina) of Williamsburg; 9 grandchildren; 27 great grandchildren and 11 great-great grandchildren; five sisters, Judy Davis of Williamsburg, Roberta Teague (Junior) of Williamsburg, Fannie Dalton of Toledo, Ohio, Alla Jane Fowler of Cullman, Alabama and Joyce Maggie Baker of Williamsburg; three brothers, Ewell “Jamup” Lawson (Janie), Johnny Allen Lawson (Rita) and John David Leach (Angie) all of Williamsburg; and a host of other family and friends to mourn her passing. Visitation will be from 1:00 P.M. until the funeral hour on Sunday, November 25, 2018 at Cooks Baptist Church. The Funeral Service will be at 2:00 P.M. Sunday, November 25, 2018 at Cooks Baptist Church with Rev. Ewell “Jamup” Lawson and Rev. Waylon Mason officiating. Following the Service she will be laid to rest in the Anderson Cemetery on Lot Mud Creek Road. To send flowers or a remembrance gift to the family of Linda Mae Anderson, please visit our Tribute Store. "Email Address" would like to share the life celebration of Linda Mae Anderson. Click on the "link" to go to share a favorite memory or leave a condolence message for the family.